Find the book, the wines, great gifts and cool clothing in our store. A true love story about dreams, passion, failure, courage, family, friends, inner strength, entrepreneurship and hope. With no experience in either farming or winemaking, they learned to grow and produce award-winning wines. Their background in the music and entertainment industries enabled them to conceive the world’s first brand pairing wine and music. Their story of starting two small businesses while raising a family is a testament to the American Dream. Whether you are interested in jacketed hardcover or prefer Kindle or iTunes, “Dream. Build. Believe.” is available in several formats. A delightful read for anyone interested in either love or wine, or both together. 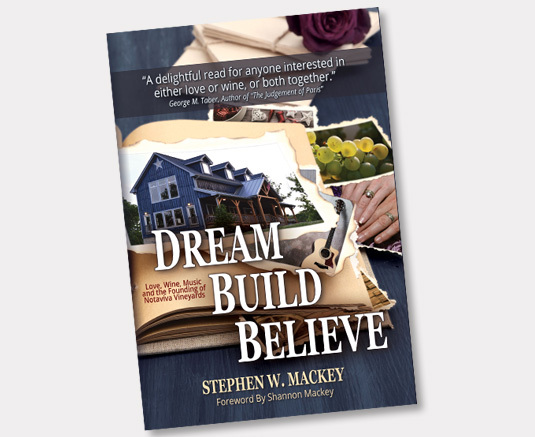 Stephen Mackey has penned a memoir both revealing and inspiring for anyone seeking to flee the city for the vineyards. Once you start reading, you won’t want to stop, eager to find out what adventure, joy or heartbreak lies on the next page. The most amazing thing is that it all really happened.